Integrate our mapping module into your contact page and your customers will have no issues finding your location. Gain valuable insights into your client’s travelling habits and locations by analysing the data we provide to you. 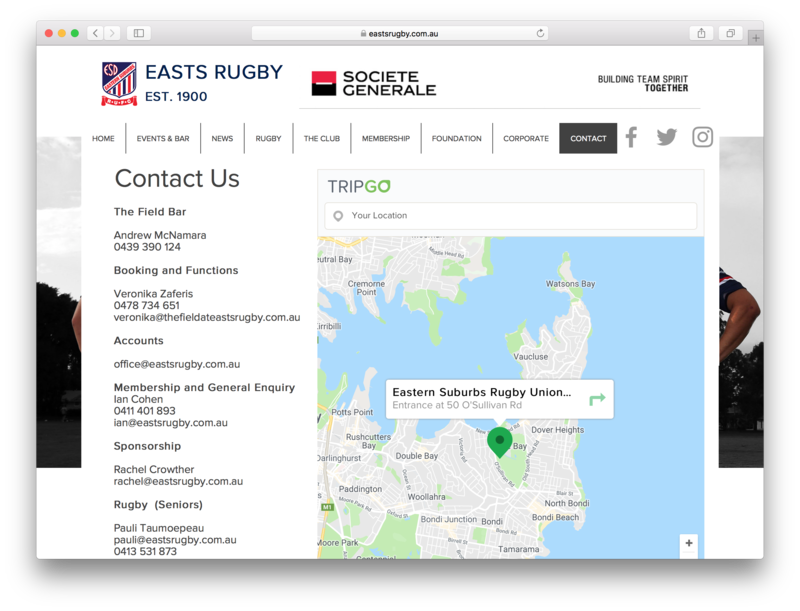 Easts Rugby Club wanted to give their fans an easy way to find their location. With the TripGo Mapping Module, fans can quickly plan the fastest, cheapest or most environmentally friendly trip to their favourite destination. MapGo offers us information which we knew would be important in the foreseeable future. This technology will help us understand our fans' travel behaviours and enable us to plan for the future. We received many emails and calls throughout the week asking where the games where and found that if a client looked up via alternative applications and found it too hard to map out their travels, they would give up and not attend. We see that MapGo is very easy to use and provides multiple travel options to suit different needs. MapGo will be able to help us connect with our fan base and understand how to get more people to attend our club sports. Talk to us about how to gain valuable insights into your customers' or fans' travel behaviour. Our developers can help you integrate this handy widget into your website. The team at SkedGo will support you along the way, not only during set-up but also for regular maintenance.